So we were gone for a while. A long while. And we've learned some lessons. I'll share them here so you can avoid them at all costs. You're welcome. FOR THE LOVE OF ALL THINGS HOLY, DO NOT DRIVE TO SOUTHERN CALIFORNIA FROM SEATTLE. I mean, you can. While 20 weeks pregnant. With a 2 year old. But I would not recommend this. It sounds like fun at first. You've borrowed a portable DVD player (LIFE SAVING DEVICE), you've made some yummy food for the road, you're staying over 2 nights in hotels to break up the trip appropriately. Seems like all should be good, right? Until. You decide that if you eat another homemade, organic peanut butter and jelly sandwich you might just lose your ever loving mind. So you grab some food. Which is, of course, garbage- even if you go to those few places that serve hormone free burgers and chicken. And then. You begin to experience the wrath of the toddler. The toddler who you forgot to change so she's soaked. SOAKED. And who was fine in the car, but now that you've decided to let her run around and get out some energy has suddenly turned into a screaming, whirling ball of angry. And forget trying to put her back into said car. Everyone around you will assume you're kidnapping her. Don't worry, the screaming subsides eventually. Just put on the Muppets soundtrack. But only the Mah Na Mah Na song. For the 367th time. Also. Keep in mind you're driving with a preggo. So you may have just passed all those slow cars on that one lane highway through the mountains. But it doesn't matter. Because approximately every 20 minutes, said preggo WILL make you pull over so she can pee. Complain all you want. Just remember, driver, that YOU HAVE DONE THIS TO HER. Congratulations! You have finally made it to San Diego! No one was stabbed so you consider this a win. And tomorrow night, Nana flies in to help wrangle the munchkin while daddy is at work all day long every day. Because this wasn't so much a vacation as a work trip that wifey and babygirl refused to let hubbs take by himself. And since preggo wifey is all high risk and can't fly, driving the total of 3,600 miles is a necessary evil. This week goes by fairly smoothly. Nana is a HUMONGOUS help and babygirl only has a few meltdowns. 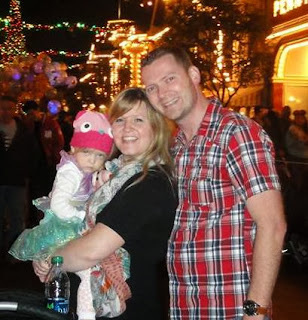 Mainly in Disneyland, when we evil grown ups dared to try to cover up her pretty Ariel dress with a sweatshirt when the temp plummeted. Imagine if you were to dismember someone with a dull butter knife. THAT level of screaming and kicking. In the happiest place on earth. Adorable. 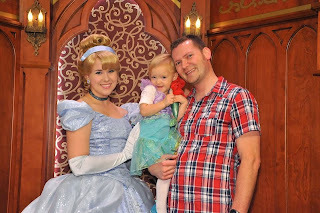 First thing in the morning, meeting the princesses. Precious. End of the night. DAGGERS. Completely. Over. It. We had many adventures, and then Nana had to leave. BIG MISTAKE. Tired preggo mamma and toddler replaced by a different, unhappy child that mamma didn't recognize in tiny hotel room with no vehicle and no healthy food options equals unhappy mess that really just wants to get the hell home already. All the Peaceful Parenting books I read flew out the window as I found myself yelling 45 times a day "DON'T TOUCH IT!!! ", "STOP SCREAMING!!" (always helpful when screamed), "STOP RIPPING THE BIBLE!!" Finally, we are free to go. THANK. GOD. So we decide to take 4 days to drive home. This seems ridiculous in so many different ways, but when will we ever drive up the California coast back to Seattle again? Let's just do it. Back in the car. This time, zero amounts of homemade food since our hotel for the last week didn't even have a refrigerator. All crap, all the time. Stopped up, cranky, tired, homesick car load for 4 days. WOOHOO. Oh yeah and Thanksgiving is just a few days away, so let's menu plan on the drive home and order a turkey over the phone. The very last one left at our fave Bill the Butcher. A 15 pound turkey for 3 people??? SUUUUUURE. It's only $92. that is totally justifiable right? Hubbs? Less than pleased. Whatevs. We had turkey. And in the final phase of ALL IS NOT FAIR FOR THE PREGGO ON A ROAD TRIP. Napa. We drove through, and stopped at, several wineries. In Napa. AND I. CAN'T. DRINK. Perfect. 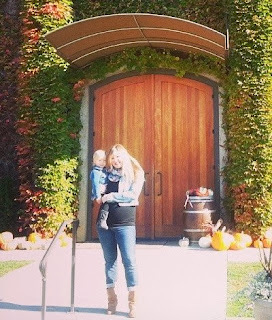 Outside a gorgeous winery, where I got to watch hubbs sample some AH-MAAAAZING wines. UNFAIR. 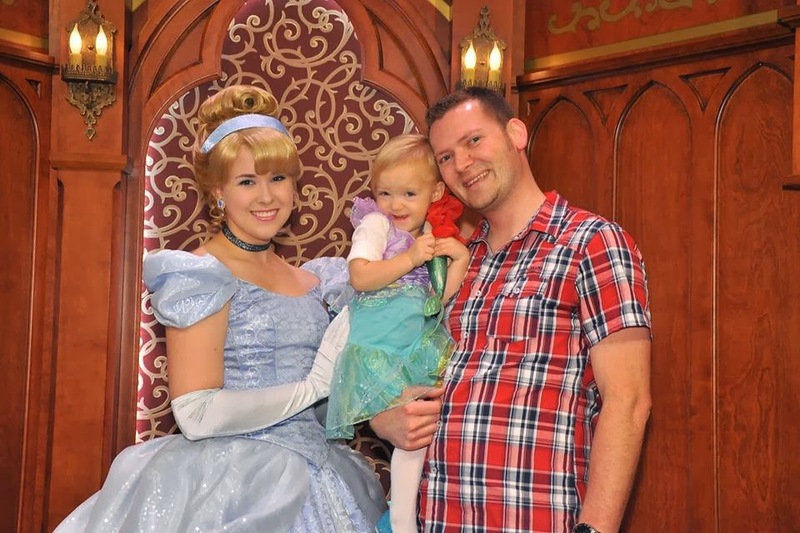 The shining light on this whole experience, besides of course getting to take babygirl to Disneyland which I've been BEGGING the hubbs to do for about a year now. We know, without a shadow of a doubt, that our organic, non-processed food lifestyle has a HUGE impact on our kiddo, and us. It took 2 weeks to get all that garbage out of our systems again and start having regular poops and attitudes. But I finally got my sweet natured, happy, helpful babygirl back! I was a bit worried she might have just entered that terrible phase and I would be SOL for Baby A's arrival. But nope. It was just all the junk in her system. So I'll continue reading all the studies on behavioral issues in kiddos connected with high fructose corn syrup, food dyes and additives, and processed foods. But I don't really need to. I got to live it for a total of 5 weeks. And now? I don't care how tired I am. I don't care how difficult it will be with 2 kids. I will be cooking from scratch almost all of our meals from here on out. (I suppose I'll give myself a break sometimes and we'll go out to a trusted restaurant occasionally). But I can guarantee that that will be astronomically easier than dealing with a crazo toddler and an infant. It might seem like asking a lot from already tired, stressed out mammas. And trust me, I GET IT. But. If you're finding some behaviors from your kiddos a bit unsavory, just give this whole organic thing, and as much non-processed food as possible, a try for a few weeks. If it is processed, just ensure it doesn't have any artificial dyes and as few ingredients as possible, hopefully all ones you can pronounce. I SWEAR ON MY LIFE you will see a difference. It's nice to have babygirl back. I'm gonna keep it that way.